The National Hockey League announced over the weekend the selection of the Los Angeles Kings, Staples Center and the city of Los Angeles as hosts of the 2017 NHL All-Star celebration. The league’s mid-season showcase will take place Saturday, Jan. 28 and Sunday, Jan. 29 and will include the NHL All-Star Skills Competition and the game itself. 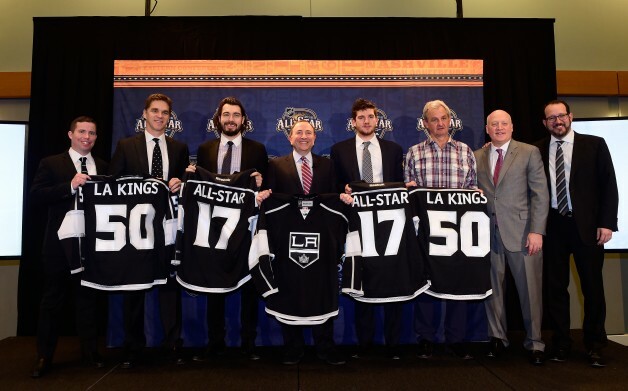 The 2017 NHL All-Star Game will be the third time the NHL All-Star activities will take place in Los Angeles. The Kings previously hosted the NHL All-Star Game in 1981 and 2002. Representing the Kings at the announcement, which was made by NHL commissioner Gary Bettman, were Kings alternate governor Dan Beckerman, president of business operations Luc Robitaille, chief operating officer Kelly Cheeseman, head coach Darryl Sutter, goaltender Jonathan Quick and defenseman Drew Doughty. Doughty, Quick and Sutter played in the 2016 game in Nashville. This marks the second time the event has been held at Staples Center (2002). That season, the Kings were represented by Ziggy Palffy and Jarsolav Modry. In 1981, the game was held at the Forum and the Kings were represented by the “Triple Crown Line” of Marcel Dionne, Charlie Simmer and Dave Taylor, and Mario Lessard. The event in 2017 will also mark the fifth major NHL event to be held in Los Angeles, joining the NHL Stadium Series game against the Anaheim Ducks at Dodger Stadium (2013) and the NHL Entry Draft at Staples Center (2010).